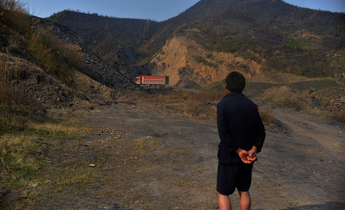 Editor's note: This is the last of a three-part series examining the impact of the coal industry on rural China. Click to read the first and second parts. Seven or eight years ago Wei Zhengfa was moved from his village of Wuchenggong in the Shaanxi province, northwest China, to resettlement housing in Lijiapan. Although his ancestral village is now overgrown and weathered by drifting sands, Wei still goes back to farm several mu (hectares) of land. 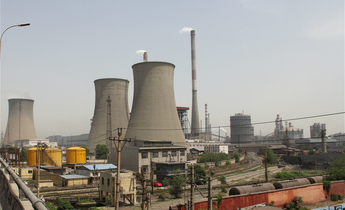 Both Wuchenggong and Lijiapan are in Shenmu country, home to China’s largest known coalfield, Shenfu-Dongsheng. For hundreds of years little changed in the village until recent decades, when villagers’ lives have been transformed by the arrival of large-scale mechanised mining. Each spring and summer, Wei cycles back up the mountain to plant corn and soybeans near his old home. Much of the land is abandoned now; tufts of grass force their way through the loose soil, approaching knee-height. Everything – the land, grass, and mountains far off in the distance – is the same colour as the loess soil. Half the nearby hillside has been quarried away, the rocks exposed as if cleaved with an axe. It’s hard to believe that this was once a shady wooded spot. 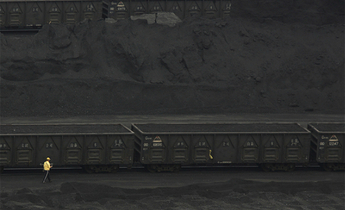 Over thirty years Shenmu became China’s top coal-producing county, and the biggest generator of coal-fired power in western China. But the coal boom was also accompanied by a host of environmental problems: land subsidence, dried-up rivers, and loss of vegetation, with knock-on effects for people’s livelihoods. In 2008, Chinese media site Xinhua reported that 56.16 square kilometres of Shenmu’s land had been affected by subsidence from mining, with 15 square kilometres (23,000 mu) of farmland affected, and 6,700 villagers in 1,900 households becoming environmental refugees. Wei’s home was in the middle of the affected area and now looks utterly ruined. The building has collapsed, and two long cracks run through the remaining walls. Cracks in the ground outside are large enough to fit a fist into. The mouth of the well in the courtyard is a quarter of its former size. From a distance you can see an area of several kilometres in circumference has sunk by four or five metres. At the edges the line of subsidence is clearly visible. Most of the villagers have left, but a few families cling on. Wei Zizhen and her husband have opted to stay. “Nobody dares to come back,” she says. Even her daughter won’t stay the night, and just visits for dinner before leaving. Follow the local river, the Kuye, downstream and the banks are lined with industrial buildings. The chimneys and cooling towers of coal-fired power plants smoke and steam and the rumble of machinery is clearly audible. The river bed is 100-metres wide and almost entirely dry and grassed over with only a few streams and rivulets left. 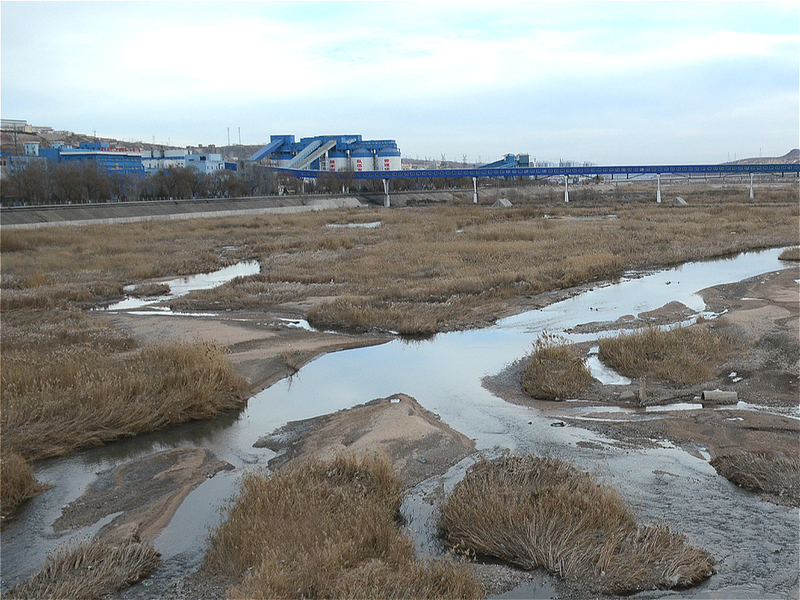 This tributary to the Yellow River has been devastated by the expansion of the coal industry. 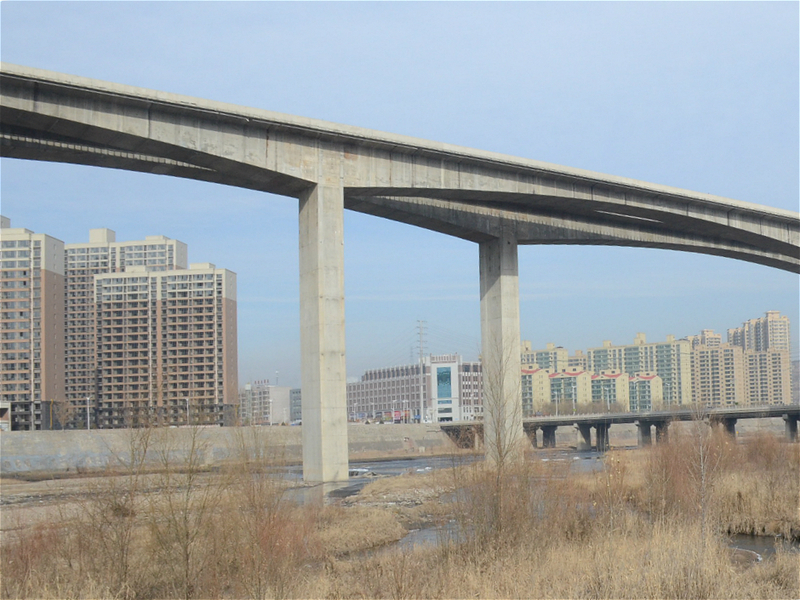 Wei Zhengfa recalls the river being 200-metres wide and flowing so fast in summer that it swept away the Erlangshan bridge downstream. But that all changed in the 1980s. In 1982 a prospecting team made a huge discovery; 87.7 billion tonnes of coal lying under an area of 7,894 square kilometres, including the Shaanxi counties of Shenmu and Fugu. This put it alongside the world’s largest coalfields: Donbass in Ukraine and Russia, the Ruhr in Germany and the Powder River Basin in the United States. According to the county government’s website, coal output in 2014 reached 229 million tonnes, an average annual growth of 9.7% since 2009. Liu Jianqiang, deputy head of the county environmental bureau, said that at one point there were 300 mines operating in the area. Many of these were small-scale, inefficient operations that have since closed, leaving about 100 working mines. The mining expansion caused a water crisis for the Kuye. 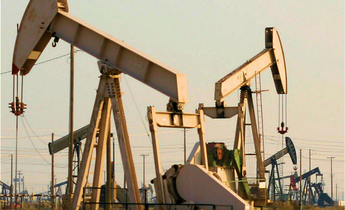 Water was diverted for mining and coal processing, and for use in coal-fired power plants. In 2014, the Yellow River Water Resources Protection Institute published a report on the environmental impact of regional planning on the river, finding that its average flow from 2001-2010 was 54% lower than the 1956-2000 average. The report analysed various factors affecting water availability and found that human activity was the main cause. Liu said that from 2005 the county invested 400 million yuan (US$57.6 million) in a reservoir in the town of Yanzhen to supply water for people in the county, adding strain to people’s water resources. Water is an even bigger problem for those still living in the areas affected by subsidence. Wei Zizhen is 60 years-old and has a stoop after decades of physical labour. Every winter, her water pipe freezes forcing her to make the five-kilometre trip to a water tower to fill two buckets. Wei makes the trip every day but struggles with the buckets. “If someone lifts them onto my shoulders I can carry them, but I can’t lift them up myself,” she said. In March this year Greenpeace published a report on how coal mining is aggravating a worldwide water crisis. 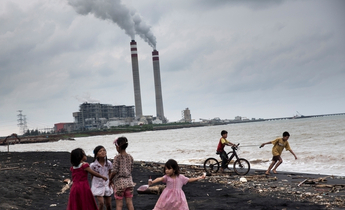 It pointed to a severe supply and demand imbalance on the Kuye and estimated that by 2020 the coal industry alone would require more water than the entire river’s supply. With the development of coal and associated industries, regional GDP in the area rose from 2.3 billion yuan (US$300 million) in 2000 to 81.7 billion yuan (US411.7 billion) in 2015; an increase of 35-fold in only 15 years. But nobody knows the costs of the environmental damage caused by the coal industry, much less how long it will take to repair the damage. “You’d come up with one number, I’d come up with another, an expert yet another. Nobody knows. Remediation could mean full treatment of the soil or planting a couple of trees,” said one official from the Shenmu town of Daliuta. In fact, it is expected that an energy and chemical hub that is currently under construction will exacerbate the environmental problems. 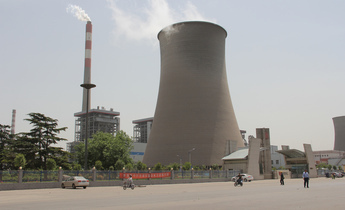 The Greenpeace report shows that coal-fired power plants already operating in China use 7.4 billion cubic metres of water a year; half of which is in regions where too much water is being extracted already. On the upper reaches of the Yellow River alone there are more coal power hubs being planned at Ordos, in northern Shaanxi and at Ningdong. 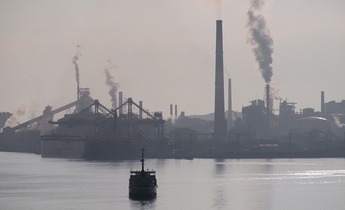 “There’s nothing else we can do,” explains Liu Jiangqiang, “We don’t like this type of growth either, especially in environmental terms.” But he says from a national standpoint the development is necessary, and all that can be done is to promote large-scale efficient operations and better handling of pollutants. 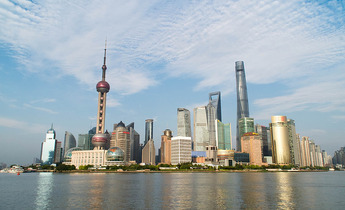 However, Teng Fei, deputy professor at the Institute of Energy, Environment and Economy, Tsinghua University, said that environmental and health costs are not reflected in current fossil fuel pricing. Including these costs would result in a different calculation as to whether further coal development is needed, and could help conserve resources. “Environmental costs aren’t fully realised in the price of coal, and that's one of the main causes of overconsumption of the fuel,” Teng said. 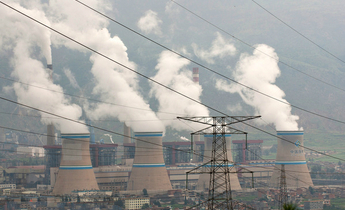 Teng said that in the future China will have to reform pricing mechanisms for coal and other fossil fuels, and in particular bolster environmental taxes on coal consumption. It is clear from Shenmu’s scarred landscape that that future cannot come soon enough.